With the recent release of Social Cloud, I asked the RedBit team what are the top reasons for using Windows Azure Mobile Services and here is what we have. 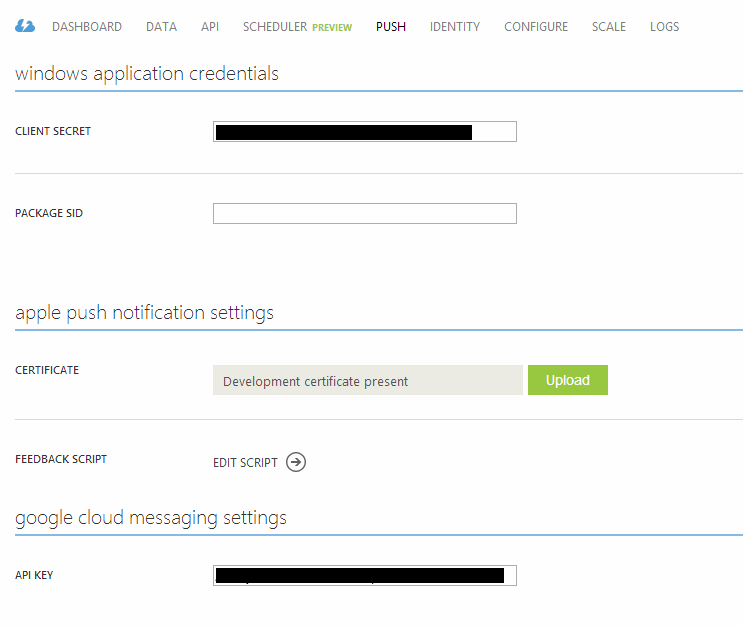 Using the Identity feature of Azure Mobile Services allows developers to quick implement OAuth based authentication without having to worry about a lot of the plumbing code that is required when writing everything from scratch. Using the data feature of Azure Mobile Services developers can quickly create data tables, secure the data tables for read/write operations and also write custom scripts to run when an insert, update, delete or read operation is performed on the data. 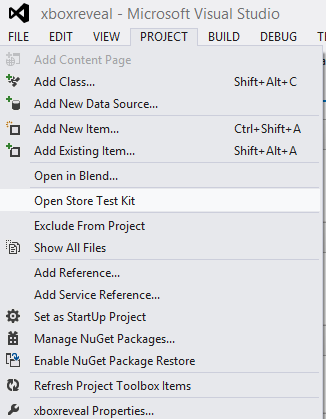 From the client side, using the SDK, you call the MobileServiceClient.GetTable<>() method and data will be retrieved. If the data is secured via the portal settings, you will need to login using the client SDK before attempting to retrieve the data. For more information see Get Started with Data in Mobile Services. 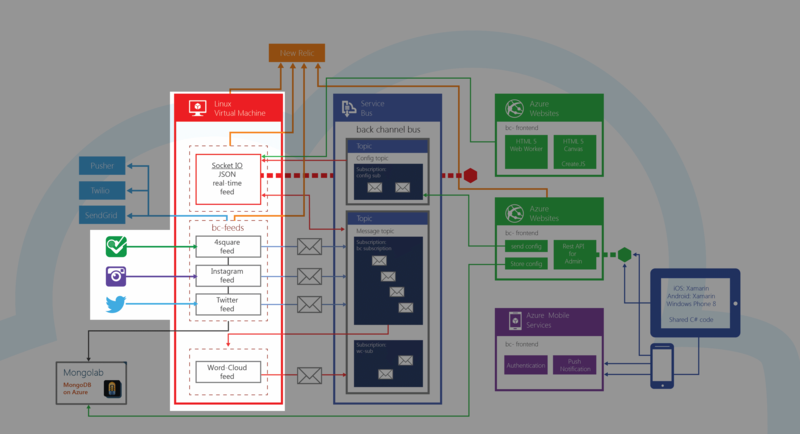 Leveraging this library and Azure Mobile Services on the back end, developers can focus on writing their app and not all the extra plumbing required for things such as authentication. The API feature is relatively new (as of Jun 24 2013) to Azure Mobile Services but allows developers to quick build APIs to the systems to be accessed by various client applications. You can quickly build out the APIs required by your app and just as quickly secure the APIs making sure only authenticated users have access to the APIs. Definitely something to use more often in the future! I’m a big fan of push notifications for mobile apps because it allows users to stay connected and engaged with their users. It’s also a great way to entice users to open your apps and this is especially useful if you are monetizing your apps with in app advertising. Definitely something every developer should look at to keep their users engaged with their app. 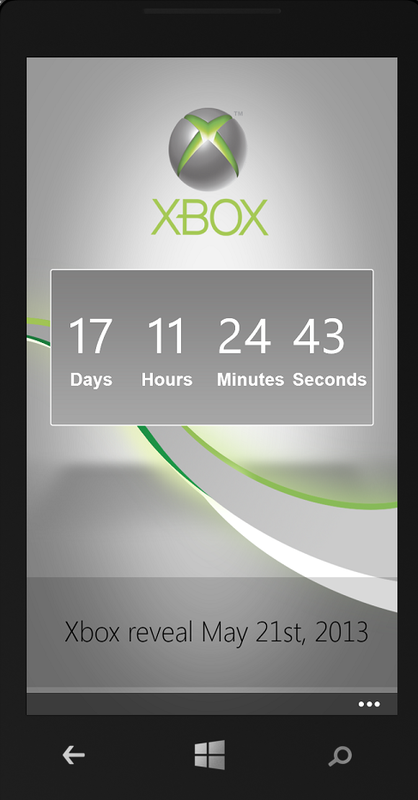 For more information on how to get this running, see Get Started with Push Notifications in Mobile Services. Overall, I think Windows Azure Mobile services really helps accelerate the development cycle and get your product to market faster. It allows you to focus on building out your product on not have to worry about server infrastructure or plumbing code required for things like authentication. When you need to scale, it’s just a few clicks and you are ready to handle your extra load from your users. So those are our top reasons for using Windows Azure Mobile Services. If you have used it, what are your top reasons? Ping me or the RedBit team on Twitter or leave a comment here. Tracking and visualizing social media streams in real-time and across multiple social networks can be a challenge. Three months ago we set out to address this challenge, in partnership with our friends at IdeaNotion and Microsoft. Today we’re pleased to release as Open Source the Social Cloud project. Social Cloud allows users to monitor various social media channels such as Twitter, Instagram and FourSquare, aggregate and process that data (e.g. generate word clouds) and expose real-time streams to web & mobile clients. On the outside, seems like a pretty easy concept, but internally there are a lot of components to make this an efficient scalable system. Here is a list and description of all of the features used for the system. 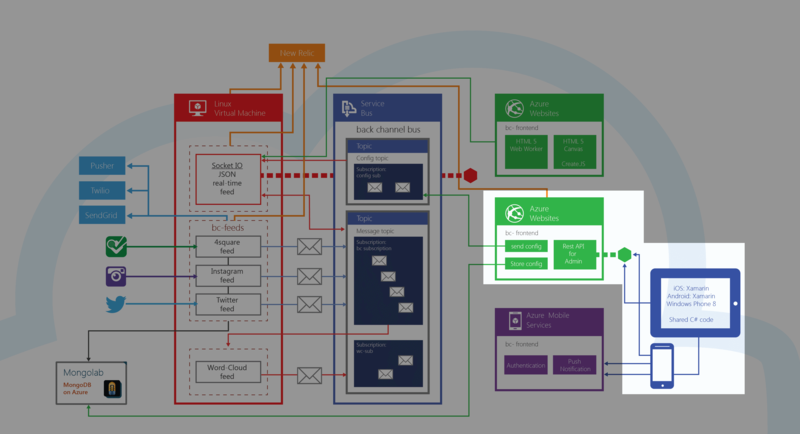 Windows Azure has the ability to run Virtual Machines or VMs in the cloud. The ability to spin up a VM in a few minutes is great from a development standpoint because we can spin up test boxes with minimal effort and minimal network infrastructure. Social Cloud leverages this feature and we utilize Linux VMs to run our NodeJS processes. We went with a Linux VM because of WebSockets support and we needed a little more control than what Azure Websites provided. Also, the development team felt more comfortable with Linux VM instead of Windows and allowed us to easily start multiple NodeJS instances to monitor social media streams. 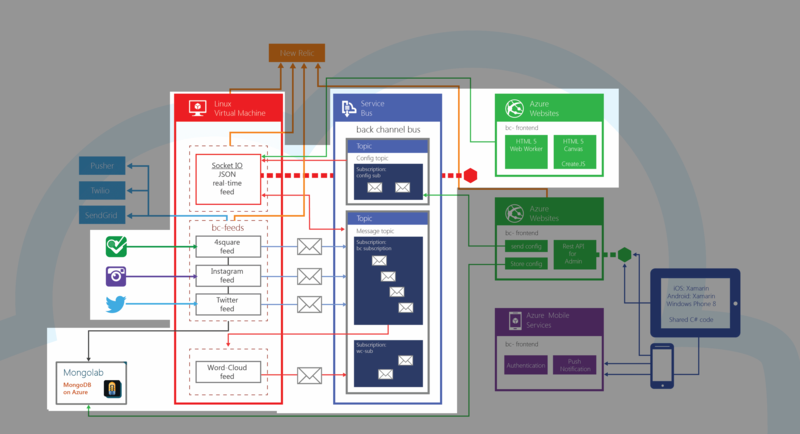 As you can see from the diagram, there are multiple NodeJS instances running each monitoring their own social network. In the case of Twitter, we were able to use their streaming API for realtime results while the others are using a polling techninque. Once we receive the data, we store it in a mongoDB instance and pass a message off to Azure Service Bus for downstream processing. 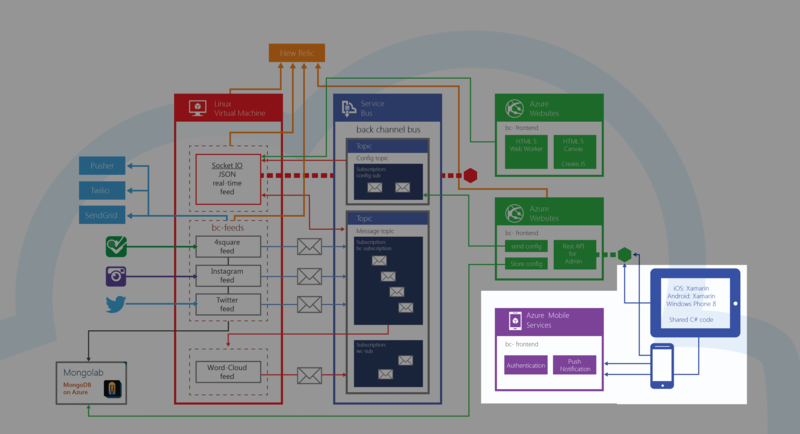 Social Cloud uses the Windows Azure Service Bus to detach the process of gathering the various social messages from the processing of said messages to ensure that we can receive the messages as quickly as possible. 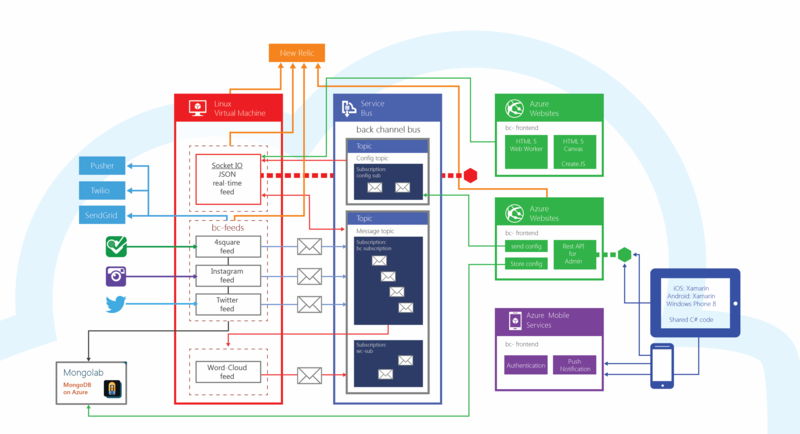 One of the different processes that subscribe to the Azure Service Bus topics are the Word Emitter that listens for text based messages and splits them into the words, processes them, then places new messages back onto the Bus. Another subscription listener is the Socket.IO process that passes incoming messages from the bus to each of the listening Socket.IO clients. This separation also provides the benefit of being able to withstand one component failing, as the messages are queued until the process is brought back online. 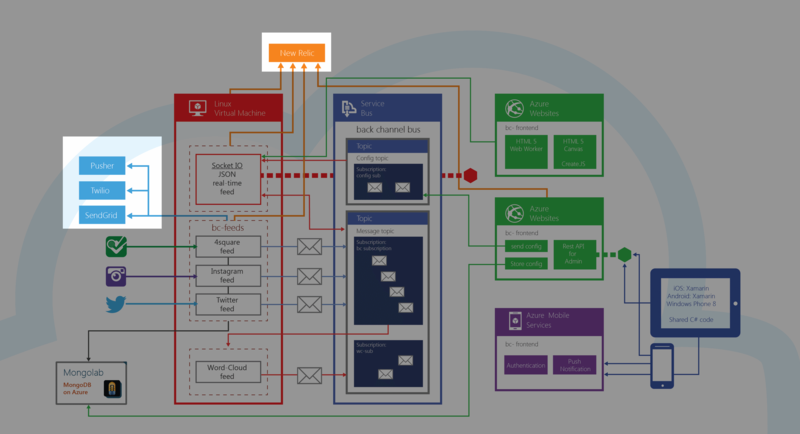 Social Cloud leverages Windows Azure Websites to run the administration dashboard which is written using NodeJS. This site also provided APIs to be accessed by iPhone, Android and Windows Phone apps. We leveraged the Git deploy feature available and the integration with BitBucket for automated deployments. Windows Azure Mobile services are one of the new features that is still currently in preview mode but we still did manage to use some of the features available for the Social Cloud solution. APIs – APIs is a relatively new feature and essentially allows developers to implement some custom REST APIs required for the system. It also easily allows developers to add support for permissions to any operation performed. 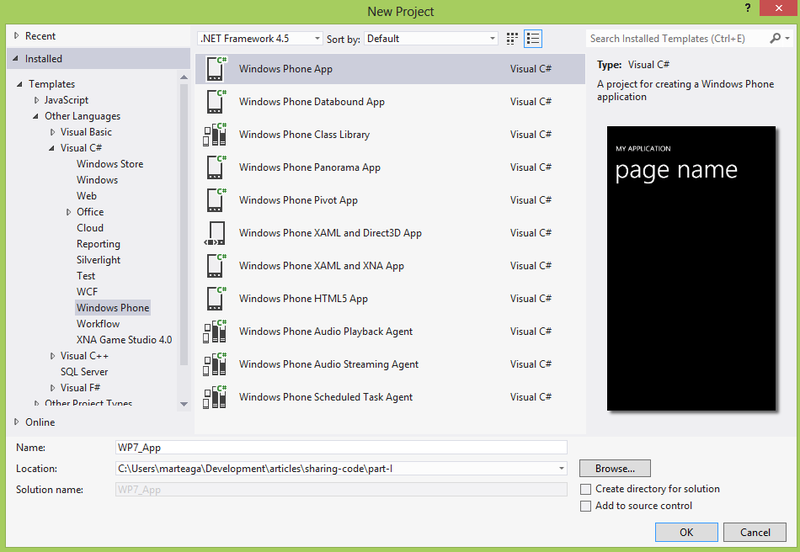 Push – this feature allows developers to create native push notifications to Windows 8, Windows Phone 8, Android and iOS clients. This is great as you can quickly get this infrastructure setup in minutes. Identity – authenticating users is usually required in mobile apps. Social Cloud required it as we only allowed authorized users to access the data. Using the Identity feature we were able to quickly add authentication to things such as Google, Facebook, Twitter and Microsoft Account. Essentially, Azure Mobile Services allowed us to quickly implement features such as authentication on mobile clients, and let us build out the features of Social Cloud and not worry about plumbing required for things such as authentication. Social Cloud is a pretty extensive system requiring many different custom components and third party components to produce the required functionality. 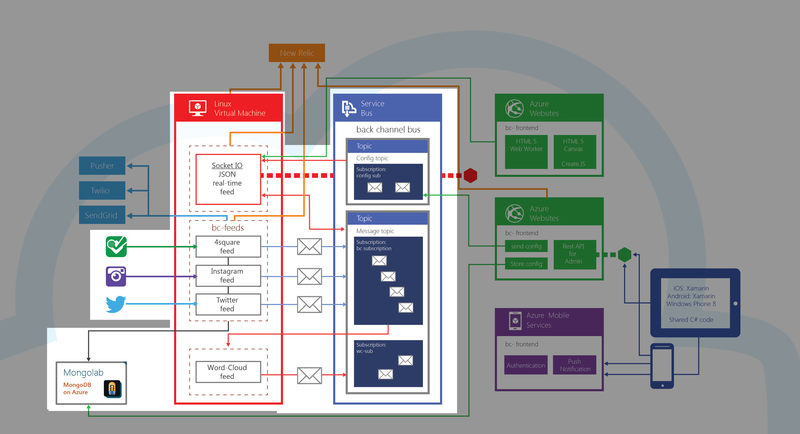 Using Windows Azure and the different features available such as Azure Mobile Services, Virtual Machines and Service Bus allowed us to build a robust system quickly and easily. Over the next few days we’ll be posting some technical blog posts on the system but as of now all the source code is available on GitHub. Be sure to monitor this blog or follow me or the RedBit team on Twitter to get notified when the code is released. When building out apps, there are some situations where you are required to get a unique ID of the device whether it be for analytic data or to potentially limit devices from accessing some private services. This quick tip will show you how to get the device ID on different platforms such as Windows Phone 7, Windows Phone 8 and Windows 8. If you are using this code to get ID with your apps, be aware that the ID returned will be different in every app. For example, if you have APP1 and APP2, APP1 may return 12345 as the device ID and APP2 may return 09876 as the device ID even though they are running on the same device.